Bathrooms are often the smallest room in the house, so it’s really important to choose the right-sized tiles to make them feel as big and bright as possible. But it's not just about size: dark tiles used in the wrong part of the bathroom can make it feel smaller. Conversely, tiles that reflect light are a great way to make the bathroom feel lighter, while laying floor tiles diagonally can make it look wider and longer. Another trick to make a small bathroom feel bigger is to use the same wall and floor tiles. Love the idea of dark tiles, despite your bathroom's modest proportions? As part of a contemporary bathroom design, pick tiles with a shimmering, multi-tonal effect. They'll add texture, depth and dimension, and will reflect light more than tiles with a flat finish. Picking small mosaic tiles can make a bathroom feel busier so limit them to one or two walls and contrast with large format floor tiles. The basic rule of thumb for choosing patterned tiles for a small bathroom is to go for graphic designs that can be used cleverly to stretch the space (visually, at least). Here, a horizontal(ish) stripe will make a narrow bathroom feel wider. Match with large format, fuss-free floor tiles for the floor. If you need some advice on choosing bathroom floor tiles, be sure to go and check out our guide. Any tiles that create a diagonal pattern, however subtle, will create another visual trick: that of lengthening and widening walls. The same ruse can be used with plain tiles laid diagonally. If yours is a very narrow bathroom, avoid putting tiles on all four walls; instead, create contrast and interest with a paint colour. Psst... we have loads more bathroom design tricks, to help a small bathroom to look bigger. Go take a look! Designing a bathroom on a budget, but would like to invest in luxury tiles? Go for a statement wall – preferably the one that frames the bath, since you'll look at it the most – and keep the other walls simple, perhaps painted with a toning shade. The upside of creating a feature wall? You notice it, not the room's modest size. If your bathroom has a low ceiling, fitting tiles like this, in a vertical column, will draw the eye upwards to create the impression of a taller room. Which colour to choose? Pick light, toning shades. Grey is everyone's favourite colour these days; we have grey bedrooms, grey living rooms, and, yes, grey bathrooms. To counteract the potential for a cold looking room, combine grey tiles with a warm oat or rusty shade. A black bathroom can look very chic and inviting, and keeping to just one colour means that you can really go to town with different textures and patterns. In a small bathroom, pick a colourful or warm metallic contrast for bathroom furniture, towels or accessories to lift the scheme. Invest in good lighting and a large mirror, too. Both will make the room feel more spacious. For more black bathroom design ideas, go take a look at our gallery. 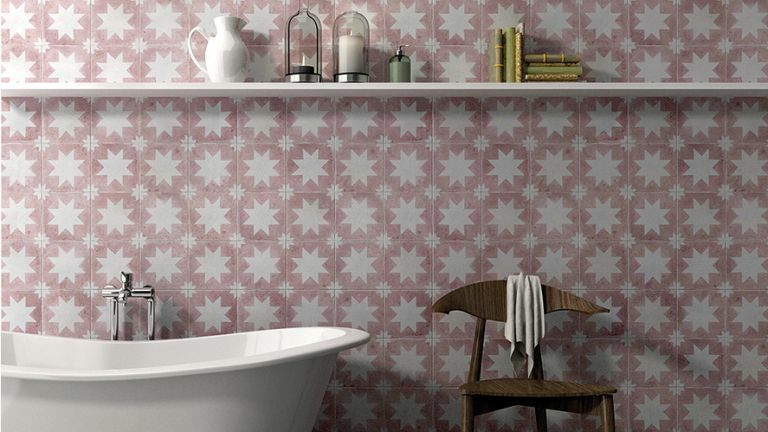 Want to introduce colour and pattern to your small bathroom walls? Picking a design with a warm colour scheme – like this dusty rose – will make the space feel welcoming; sticking to very plain finishes (whether towels, bathroom window treatments or flooring) and sleek lines elsewhere in the room will help it feel as big as possible, too. Metro tiles are endlessly fashionable – but also great for use within a small bathroom. Why? The strong horizontal lines they create when on the walls create the widening effect we mentioned earlier. Limiting the tiles (any tiles for that matter) to beneath dado rail level, with a paler paint colour above, will also make the room feel taller. Win win. If you love these classic tiles as much as we do, go and check out these beautiful ways to use metro tiles. Want to introduce dark tiles while keeping the bathroom as light, bright and spacious-feeling as possible? This is the perfect tile combo: dark bathroom floor tiles and pale-coloured bathroom wall tiles. Got a shower room or wet room? Stretch space visually by using the same tile throughout; it'll also give you a smart, contemporary look – and make for super-easy cleaning. Choose an off-white tile with a marble effect for warmth, texture and interest. If you fancy adding a wet room, go and have a read of our guide to get you started. As we have mentioned, you don't need to tile a whole load of space in a small bathroom for it to have an impact. Try instead using a bold tile, in a brave shade or interesting shape, for the inside of your shower. Scalloped tiles are such a big trend right now (in fact they even made it into out round up of the top interior trends), and these Syren tiles from Topps Tiles come in five glorious sea-inspired hues.